I just wish I had taken more photos, and asked Joy more questions! Her class covered so much that it was like a feast. I still haven’t had time to review and think enough about all the new braids and braiding ideas that came up for me in this class (in my own defense, September has been busy—work, a music festival, a family wedding, jury duty, and a now a camping trip). I just want to get something posted about the rest of Joy’s workshop before October arrives…I’ll have to fill in, make corrections and add the correct Japanese braid-names later, that’s all. Above is Joy on her second day, diagramming the moves of a Japanese kute-uchi braid. (Kute-uchi is a Japanese form of loop braiding in which loops are held around the whole hand rather than on individual fingers.) Joy had brought along her prized copy of Masako Kinoshita’s definitive book*¹ on historic Japanese loop braids. I started with a solo-braider braid, and then worked with Dominic on a team braid. My main problem was that I had only managed to get 2 hours of sleep the previous night! I was able to braid, but not to think very clearly. I realized later that I must not have taken photos of all of Joy’s sample braids, and I forgot to take any pictures of their labels, so I’m still not sure of their Japanese names. I should be able to figure this out at some future point from the many files of kute-uchi charts that Joy so generously sent us, but there are so many of them that I still haven’t tackled this task! We used cord kute (handles) to hold the loops. Before the conference, Joy had sent us directions*² for making these, and she also brought some extra sets that she had made. Years ago, in my one previous kute-uchi class I was very surprised to find myself making a braid that came out as two separate square braids at once, one above the other! And similarly a bit later, a braid that came out as four little flat layers—4 separate braids simultaneously, stacked on top of each other. With fingerloops, you can braid two-layer braids (even a simple square braid has two layers), but with hand-held loops you can actually braid four-layer braids! Depending on how you braid, the same (or very similar) number of loops and almost the same moves can come out as: two separate square braids stacked on top of each other; a rectangular braid of two attached square braids stacked on top of each other; four separate flat layers stacked on top of each other(! ); a square braid in the center with a thin flat braid above and below it, etc. 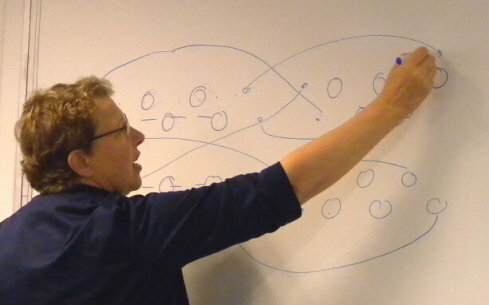 It all depends on whether and where you turn the loops to connect the four layers…as well as whether you start with an odd or an even number of loops on one or both hands. 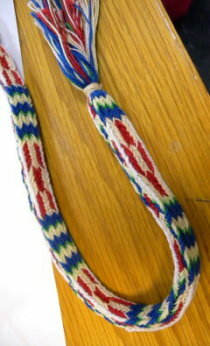 Unlike fingerloop braids of only two layers, with four layers being formed from one set of hand-held loops, certain connections between the layers will only work with an odd or even number of loops on the two hands. But what I didn’t realize until here in Joy’s class, is that these same 4 layers can also be braided so that they connect accordion-style, stacked in a Σ-shape!!! 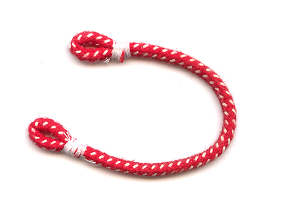 (each straight segment of the “Σ” representing one of the four braided layers). After it’s finished, this version of the braid can then be spread open to be a quadruple-wide flat braid! At least this is what I dimly gathered from Joy’s diagram on the white board. This was the solo-braider Japanese braid I decided to try. I can’t find the sample I made, and I don’t think Joy had one in class, but it definitely comes out as a wide, flat braid of 8 columns/ ridges, pretty much identical-looking to a flat double-braid made by a team of two people using finger-held loops. *³ This double-flat braid requires an even number of loops on one hand, and an odd number of loops on the hand that has the only turned loop transfer. (Another amazing single-worker kute-uchi braid is the Genji-uchi braid—click on link for instructions in an earlier post). Another quadrupled square braid sample by Joy Boutrup—massively square in cross-section. I think Joy has her own way of managing to make this braid by herself, using her hand-held loops. I wish I had asked her for more specifics on how she does this! Back when I was practicing kute-uchi braiding after my first workshop in it, I found it much more “slippery” and difficult to manage the loops of two braiders using hand-held loops than when using finger-held loops. Let alone the loops of three braiders! I do that for the European “Katheren Wheele” braid, but even though it looks fancy, it is half as complex as this double-square 3-worker braid above. I was so taken up with everything else that I never got around to asking Joy about the two braid samples above. They are two-layer braids, like a square braid, but four times as wide (8 ridges on each side rather than 2). Braids like this could be made (with either hand-held or finger-held loops) by 4 braiders cooperating, each making the moves of a square braid. 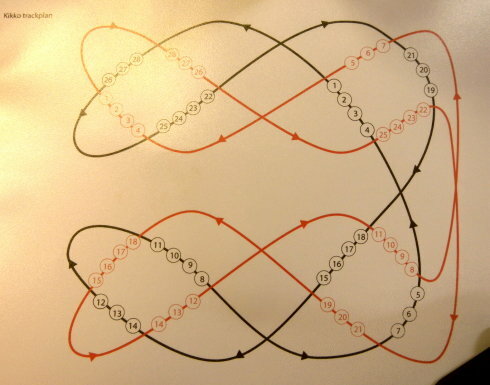 They are similar to European doubled “spanish” braids (like the 14-loop letterbraid)—but with all the loop transfers crossed (turned). The European 14-loop letter braids were made by only two braiders cooperating, but each one made four loop transfers per braiding cycle, instead of the two transfers of a square braid. The beautiful color-patterns in these samples are made with bicolor loops (plus I guess two single-color green loops, in the case of the multicolor braid). Not the site of the conference! 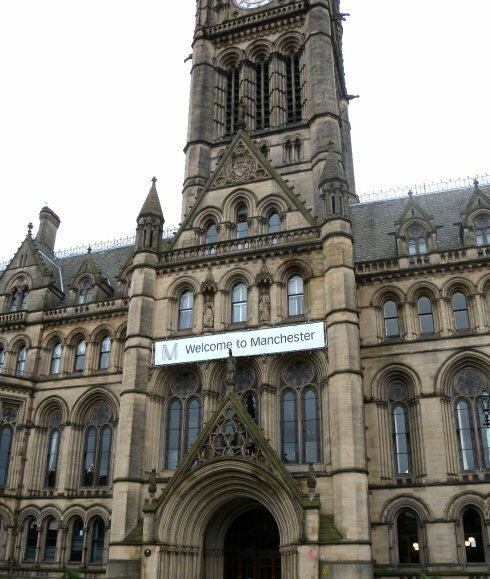 This is Manchester’s town hall, in Albert Square. The ones she had brought with her to the class seemed thinner than the one in this photo. They were great to braid with! Here’s a link to Masako Kinoshita’s photos and directions (opens in a new tab) for various other ideas for kute. Holding kute instead of thin braiding strands makes it easier to manage all the loops—a single kute-uchi braider might hold more than 10 loops in each hand! Simple kute/ handles can also be helpful for finger-held loops if you are braiding with floss-type untwisted bunches of hard-to-manage fine silk strands. I’ve occasionally used short lengths of cotton string as ‘finger-kute’ when braiding with bundles of fine silk. *³ I was very interested in learning this flat version of the ‘double-square’ kute-uchi braid, because it’s almost identical to the flat ‘double-braid’ [update: click link to go to my new tutorial for these] that I would be teaching later on, in my workshop, using finger-held loops. 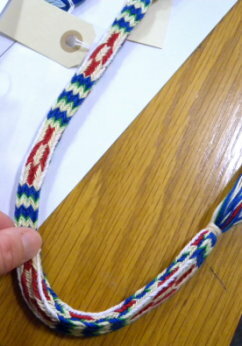 The traditional way this is done (using finger-held loops) requires two braiders working together. One braider would make the braiding moves for a divided, two-layer braid (all transfers unreversed/open/ no turned loops) and the other braider would braid the two layers of a flat braid, making only one transfer with a turn—on the far edge of the braid. I use a non-traditional solo-braider method for making this braid that I find very convenient. But with more than eight loops, the kute-uchi method might be easier if you don’t want to bother with learning how to use thumbs to carry loops. A YouTube report about Braids 2012 from “Japan Outpost”—a Manchester-based Japanese culture organization. The video shows a few snippets of the conference, and an in-depth interview with Debbie Richardson, the conference organizer. 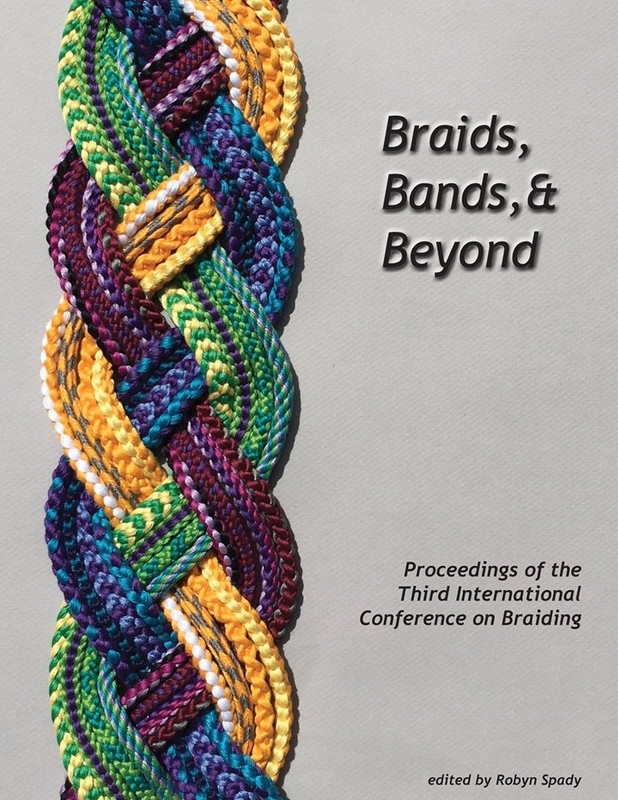 Carol James, teacher and author of books on fingerweaving and sprang, posted about Braids 2012 on her website Sashweaver (incl. 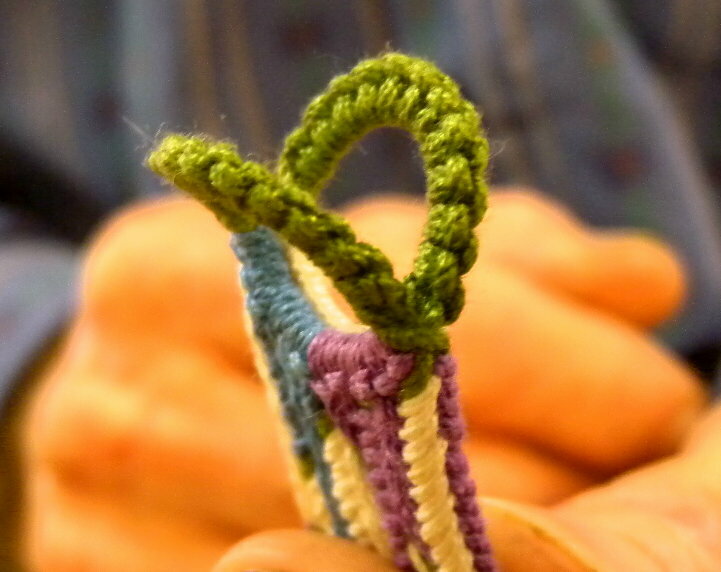 some photos from Joy Boutrup’s loop braiding workshop). Carol Miller Franklin posted several reports straight from the conference on her site Braidweaver. Mari Voipio has a report on Braids 2012 on her blog Playing with Yarn (in both Finnish and English). Laverne Waddington posted a report on her blog Backstrap Weaving, with many photos. My just-previous post on the conference: Braids 2012, part 1. My subsequent post, mostly about the class I taught at the conference. Your unnamed “double braid” looks like Chusonji gumi. The braid’s 2 columns of slightly curved-looking edges is very typical with firm braiding tension. It’s how my flat double braids always come out right after braiding. It looks great like that, “au natural.” If you want to flatten it completely, wet it in water and lay it flat on a cloth or hang it over a towel rack after gently pulling the edges apart / flattening the braid. It will be even wider when it dries flat.